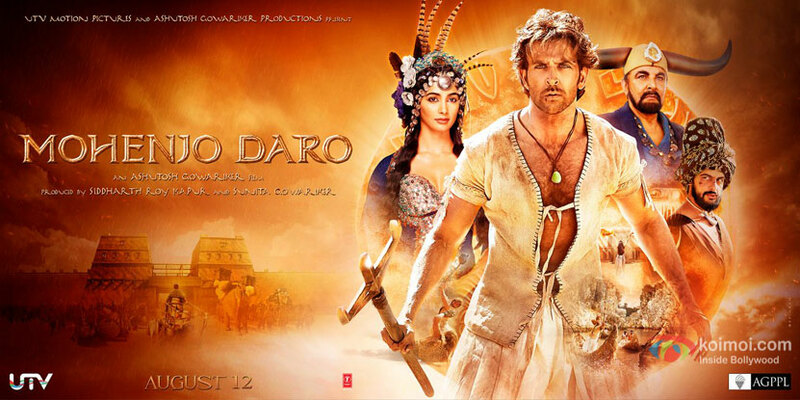 Mohenjo Daro is about the farmer Sarman (Hrithik Roshan) who travels to the title city against his aunt and uncle's wishes, where he discovers the extent of the injustices carried out against the people by the evil Senate Chief Maham (Kabir Bedi), and falls in love with the beautiful Chose One, Chaani (breakout performance from Pooja Hedge) who is destined to bring in a New Era. The acting is on point across the board, from the main actors to the supporting cast, and every character comes to life with heartfelt sincerity. While I watched I could feel the joy, wonder, love, and turmoil from each character as they went through their stories and hardships. Hrithik Roshan was wonderfully sincere in his portrayal of Sarman, and Pooja Hedge had a strength and screen presence that I can't wait to see again. Visually and musically the film is absolutely stunning. There are a couple of points where the special effects felt a bit... not rough, but perhaps unnecessarily dreamlike? There was really only two minor points when I felt the visual effects pulled me out of the story, otherwise it was seamless. The music more than made up for it. The soundtrack was... hauntingly beautiful. I was disappointed that we only got two song and dance numbers, despite three songs being released as promotional material and my assumption there would be more considering the length of the film (just over 2 and a half hours). The two songs we did get, Mohenjo Daro and Tu Hai, were amazing. Watching Hrithik Roshan dance is never disappointing. That aside, I also loved the soulfulness of the dances, and the ability of Roshan and Hedge to bring their characters to life through their dancing. I really appreciated that Hedge's character of Chaani was not reduced to a weak love interest turned prize, and was given at least a couple of chances to show strength in her role. For that matter I felt that the few female characters who had speaking roles (4) were given real character, even if it wasn't for very long. It almost made up for how little women had to do in the film overall. Despite complaints from other viewers and critics about the historical inaccuracies, I really enjoyed the costuming. The variety, the colorful simplicity, and yes, Chaani's headdresses, added to the overall beauty and color of the film. It was splendid. Halfway through the film, a Big Reveal occurs, and it shifts the direction of the story. Everything comes to a head, and there are a couple of pretty brutal fight scenes as the characters face the repercussions of the conflicts from the first half of the film. The pace picks up from there and keeps up until the credits. I didn't feel this was a disjointed shift, it was definitely eluded to early on that this was coming, though I can see how some might feel like the film seemed to change genre. I disagree, but then this is all opinion anyways. Was the movie perfect? No. Was it wonderful? Yes. Definitely. I walked out of the cinema knowing that I was going to get the soundtrack, that I wanted to go see the film again (I did), and that I can't wait until it is released on DVD. I find it fun to look up what type of tropes stories have on TVTropes.org, so I thought I'd include a list (not comprehensive) of what I spotted in this film. This is in no way a criticism of the movie on my part. You should see the lists my friends and I come up with after going to see the popular American blockbusters - easily twice as long in some cases, and these are considered tropes for a reason after all. But...how many times do we get to see Hrithik Roshan's abs of titanium?